So back in August when I was up in Nashville lurking at a gig and trying to get in the way, I had the privilege to meet a real rock star in our little audio world: Bob Heil. If you’ve ever heard Frampton Comes Alive!, you’ve heard one of his many inventions, the Heil Talk Box. But Bob’s tremendous impact on live sound goes beyond a little guitar FX box to things like designing the first electronic crossover and the first modular live sound console. The Who credited him as the first guy to design and build a PA that they couldn’t outplay. We had the pleasure of having dinner with Bob and his wife Sarah in catering at the arena, and I have to say it was quite a surreal experience listening to Bob’s myriad of stories about blowing up purported indestructible drivers back in his little music shop and tuning huge pipe organs while band and crew fixed plates of food behind him. These days Bob has been getting a lot of buzz about the new microphones he’s developing at his company Heil Sound, and after dinner he was gracious to run out to his car and bring back some mics for me to try. My good friend Mike Sessler has been talking about Heil microphones for quite a while, and I’ve had similar recommendations to try them out from several other audio friends so I was excited to head back to Atlanta with some new stuff to try out. Bob Heil is not a fan of condenser microphones, and he has really set out to design dynamic microphones with the the things we like about condenser mics like detail and clarity without some of the other side effects we might sometimes experience using them like weird sounding cymbal junk and bleed. 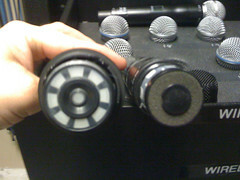 Most dynamic mics have a diaphragm that is 1/2″ to 3/4″ in diameter, but Bob has developed a diaphragm that is 1.5″ in diameter. So what’s the big deal about this? Well, I don’t know about you, but when I think of the microphones that most singers use in recording studios, I think of big diaphragms. 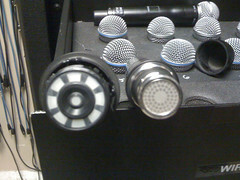 For comparison I took a couple of photos comparing Bob’s PR35 capsule to a couple of mics in our existing inventory. In the photos here you can see the Heil RC35 capsule next to a KSM9 in the first picture and a Beta58 in the second. I was given two mics to demo, an RC 35 capsule and a PR 30. The PR 30 is an endfire large diaphragm mic, and the RC 35 is a PR 35 in the form of a replacement capsule for Shure wireless mics. The story Bob told me about the PR 35 is that Joan Baez was in rehearsal and a PR 30 was in use for a drum overhead–yes, a dynamic mic for a drum overhead, but I digress…. Joan grabbed the mic and started singing into it as a joke, but it turned out that she loved how she sounded on it. The PR 35 was developed in response to that and is based on the element in the PR 30. After demo’ing the mics I ended up adding 4 of the RC 35’s and 2 of the PR 30’s to our collection. Obviously I liked them, but here are some of my thoughts on the mics. 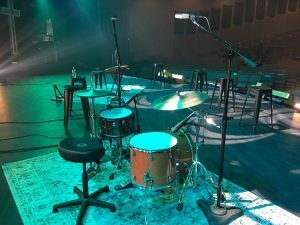 The downside of using mics in live sound is we often have to put them a lot closer to sound sources than they really should be if we’re trying to capture the natural sound of our source. Sometimes the consequences of this can be tasty and beneficial, but then sometimes it’s a nuisance. When it comes to vocal mics, sometimes I feel like I’m EQ’ing things simply to compensate for the microphone’s response which can sometimes result in surgery on an input. But when I EQ a vocal sung into the 35, I feel like I’m EQ’ing the vocal and not the mic. The 35 has a lot of detail. 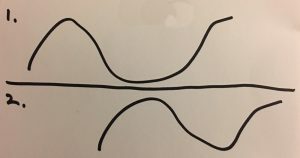 Depending on the mics you’ve been using it might even seem a bit bright at first, but I think that perception comes from the fact that the proximity effect isn’t emphasized as much as you find in some live sound vocal mics. For me the top end is great, but there is still a lot of warmth with clean low-mids. The other bonus of the 35 is the pickup pattern. I don’t even know what you would call it because it just rejects like crazy. It’s a tight pattern, but it doesn’t suffer from the lobes you get behind the mic with super- and hyper-cardioid mics. In fact, rear rejection is in the neighborhood of 40 dB down. How do you think these mics will do on stage with a bunch of screaming middle or high school students in a small room that is poorly acoustically treated? I will say this about the 35, though: like every other vocal mic, it’s not going to be for everyone or every engineer for that matter. It can be a very different animal than what you might be used to so a lot of your EQ tricks might not work. 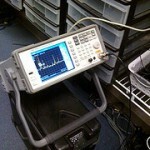 You need to really listen because you might not need ANY EQ on your source. Not all of our engineers have enjoyed the mic the same way I have, and I think it’s largely because they’re just not used to how it performs compared to the mics we’ve been using. When you’re EQ’ing the mic and not the voice, it’s a different world of mixing and a preferred one for me. I feel like the 35 let’s me hear the actual voice, and I just get to smooth it out so that it sits nice in the mix. Right now the 35 is my go-to capsule, and if it continues to work as well with all of our singers as it has with the first few I’ve been putting on it, I might need to add a few more capsules to our mic locker in the future. As for the PR 30, I haven’t done a whole lot with it just yet. I initially tried it on some guitar amps, but unfortunately it didn’t seem to work as well with our players. 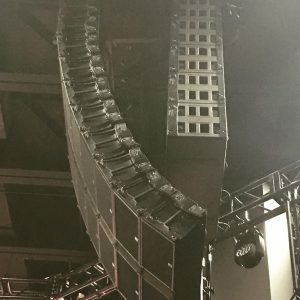 Our guys tend to have cleaner and more balanced sounds coming out of their amps, and I think we just want a little more oomph that some other mics create when you push them right up on the grille. These days we’re still liking the Cascade Fathead II’s on guitar amps because they are darker mics. If our players had thicker sounding tones, I would definitely try the PR 30 again because I don’t think it would over-emphasize the thick the way some of the mics we use can. I can think of at least one or two guys we’ve had on our stages with tones the mic would probably rock on. Right now I have our two PR 30’s mic’ing the top of one of our Leslie’s, and they’re probably not going anywhere for a while. A couple years ago I got to hear Steve Winwood and at the time he had the best sounding B3 I had ever heard. His FOH engineer was using AT4050’s so I switched our mic’s over to a pair of KSM44’s I had in the mic drawer, and I’ve been very happy with that for the last couple of years. I’ve been just as happy with the PR 30’s, and if anything I think using the 30 might even be helping the Leslie cut a little more in the mix without needing to EQ it to pop a little. I would really like to try the 30’s on overheads next, BUT I don’t want to pull them off the Leslie right now…. At some point I hope to pick up another pair for our other Leslie, and they’ll probably get some time as overheads before they meet the Leslie. So I guess the bottom-line is that the mics that Heil is putting out are definitely worth checking out. They have all the good stuff I like from our condensers, but they just seem better suited for live use. And of course one of the biggest benefits for using them in Church world is since they’re dynamics, they don’t have near the sticker shock of a condenser. I’ve been running a PR 22 on the snare for a few months now and love it. I was a die-hard SM57 guy, but read Mike Sessler’s reviews and decided to give it a try. 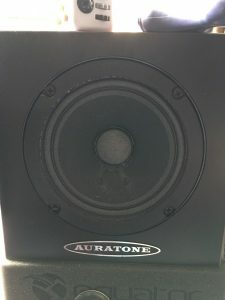 I picked up a PR 35 that I haven’t tried yet because our KMS105’s work so well on our vocalists. If I get a week with only one BGV, I’ll try the PR 35. On guitars, I love the Sennheiser E906. Sometimes I combine it with a SM57, but I find myself using the 57 less and less. The 906 gives a fuller sound. I was apprehensive to use the 906 because I had used E609’s and didn’t like them. The 906 is heads and shoulders better than a 609. I could not agree more with this sentiment. I’m using wireless Beta 87’s on my vocalists, and while they are great mics, they seem to be missing that nice clean ‘richness’ in the low-mid range so I find myself EQ’ing those frequencies out to achieve clarity. The problem is that then it starts to sound weak and empty. It’s a trade-off I’ve never been stoked about, but in church sound clarity is king. I’m going to see if I can get my hands on an RC-35 capsule or 2 and see how it goes. I purchased a RC35 a few months ago after getting it recommended to me (I tried the wired version first). I must say I fell in love with it. The only thing I wish the RC35 had was the low end roll off switch like the PR35. We only bought one of them which we use on our lead singer, all our vocal mics are Beta87As (ULX series). Personally I am a fan of having every mic the same to get an even sound, so will defiantly be getting some more RC35 capsules. I am trying out their drum microphone kit next weekend, I am really looking forward to hearing that. It seems like we change one of our guitar mics out every 6-9 months for something new. When I came on staff every amp had a 57 and a 609. Then the 609’s turned into 906’s. Then the 906’s flirted between KSM44’s and 32’s. Then we moved to the Cascade Fathead II. Everytime we switched I would inevitably go back to the 57 sooner or later. I love having a couple of mics on an amp to choose from, but there’s something about an old-fashioned 57 that still works for me. It doesn’t work for everything and sometimes one of those other mics is still the best choice for a particular amp, but I can pretty much always make a 57 work and sometimes there’s more to be said about that than getting the greatest guitar sound ever. The new Heil capsules sound great on the northpointonline.tv stream! Unfortunately, I can’t say the same for others. For instance, I think Carrie Underwood’s vocal quality greatly suffered when she switched to Heil. I read that her sound guy switched her because she liked to cup her mic grille with her hand, and the Heil mics didn’t react as badly to that as the Shures did. What a terrible reason to switch mics! Just tell her get her hand off the grille!